Betta 500 is an external LED flood light that illuminates external areas and perimeters. 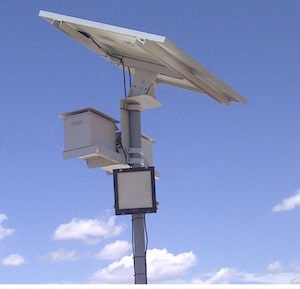 It can replace grid-powered lighting or be installed as a green fields solution. Typical applications are the illumination of security fencing, external areas, parking lots and garages, walkways, areas not economically serviceable by grid electricity, buildings and billboards. The Betta 500 light charges when there is sunlight or cloudy conditions. The light will be fully functional for 36 hours under 2.7 hours direct sun light.